and hospitality through its Share My Love campaign at KDU’s educational carnival. SHAH ALAM, JULY 24, 2017 – Malaysia Healthcare Travel Council (MHTC) or better known as Malaysia Healthcare participated in the Free Yourself Carnival (FYS), which was launched today at KDU University College in Glenmarie, Shah Alam. Malaysia Healthcare hosted an activation booth to continue its Share My Love campaign. “Share My Love” aims to create heightened awareness and spread the message of warm Malaysian hospitality and healthcare excellence among students. As a continuation to the Malaysia Loves You campaign, which was launched in February 2016 by the Minister of Health Malaysia, YB Datuk Seri Dr. S. Subramaniam, Malaysia Healthcare is spearheading an ongoing campaign, Share My Love, to increase global awareness on Malaysia’s world-class quality, affordable and easily accessible healthcare services. The Share My Love campaign is an initiative to position Malaysia as a leading healthcare travel destination and to showcase the finer qualities of Malaysian hospitality which invites everyone to come and experience Malaysia’s excellent healthcare and indulge in our warm hospitality. Malaysia Healthcare’s Chief Executive Officer, Sherene Azli believes that the FYS carnival for example is a great platform for MHTC to start engaging with local colleges in advocating for its nationwide campaign. “By participating in KDU’s Free Yourself carnival, Malaysia Healthcare intends to foster strong relationships with the local college community. We want the message to be clear that Malaysians are truly warm and friendly, as we extend our love and hospitality for anyone and everyone to embrace, especially among these budding young minds and drive more interest in the campaign,” commented Sherene. 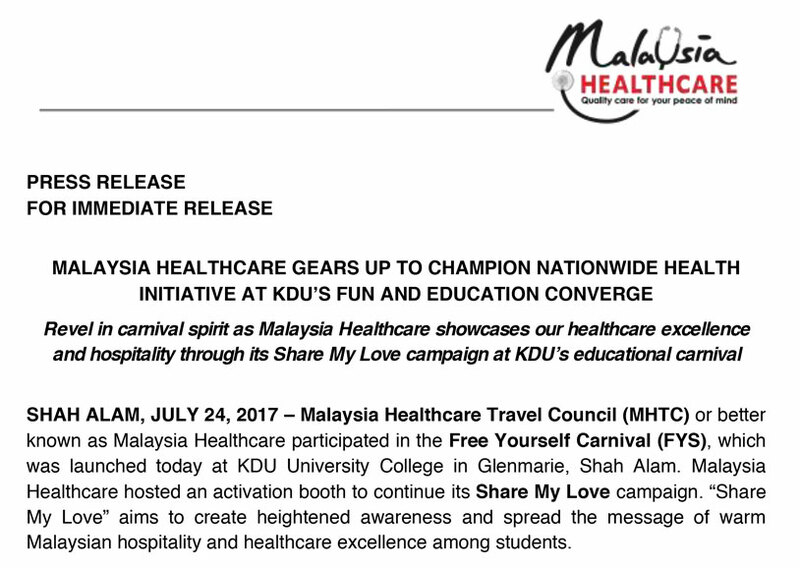 Through Malaysia Healthcare’s participation in the FYS carnival, Sherene is positive more brand ambassadors from the local college community will be roped in to champion Malaysia Healthcare’s Share My Love campaign. “Eventually, we want our brand ambassadors to tell the world that Malaysia offers the essential attributes of a leading healthcare destination – we offer quality, accessibility, affordability and ease of communication. Many are still not aware that Malaysia was awarded the ‘Best Country in the World for Healthcare’ by International Living (Global Retirement Index 2015 – 2017) for 3 consecutive years”. 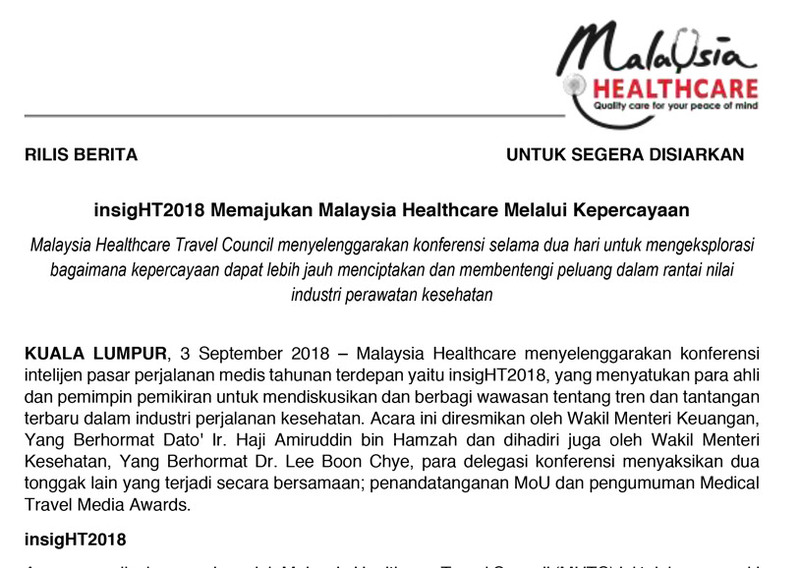 Malaysia was also presented as the Health & Medical Tourism: Destination of the Year for 3 successive years by the International Medical Travel Journal (Medical Travel Awards 2017) added Sherene. Organised by the Event Management class of the School of Communication and Creative Arts (SCCA) of KDU University College, the one-day carnival aims to foster strong interuniversity relationships by inviting students from local high schools and colleges to KDU for a fun-filled, educational event. Over 200 high school students and other college students are expected to attend the FYS carnival. In addition to that, KDU is expecting 400 – 500 attendees comprising parents, lecturers, students from other faculties in KDU, patrons of the nearby Utropolis Marketplace, and employees of offices within the area, as the event is also open to the public. The FYS Carnival features a series of carnival games, bazaar, and performances, designed to introduce the aspect of communication, design, and creative arts relevant to the SCCA. The program comprises several engaging activities which are structured around the respective courses offered by the SCCA such as broadcasting, design, photography, sound recording etc.